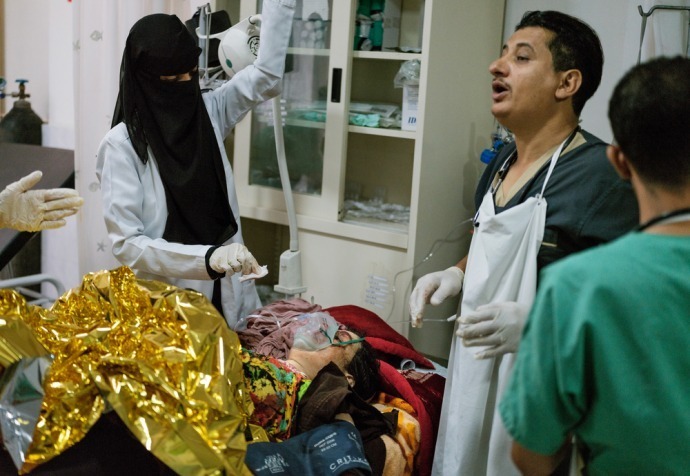 25 March 2019 – Four days of intense fighting in the Yemeni city of Taiz has left people unable to access healthcare, with at least one public hospital forced to close. The international humanitarian medical organisation Médecins Sans Frontières/Doctors Without Borders (MSF) warns that urban warfare in densely populated areas is having devastating consequences for civilians and is preventing war wounded from accessing life-saving care in Taiz city. “We are worried that wounded people are trapped between frontlines, and many of them are not able to reach health facilities inside or outside of the city,” said Caroline Ducarme, MSF Head of Mission in Yemen. There have been reports of a hospital being damaged due to fighting nearby. Additionally, one of the public hospitals in Taiz has been forced to close due to fighting, making it even harder for people to access urgent medical care. In one MSF-supported public hospital, medical teams reported that a severely wounded patient was forcibly taken out of the operating theatre and prevented from receiving much needed medical care. This is simply unacceptable. “There is a continued need for increased protection of health facilities,” said Ducarme. On the first day of the fighting, the MSF trauma centre, on the other side of the frontline, in Taiz Houban received a two year old boy with a shrapnel injury to his face after a shell landed close to his house in the old city. The family had to drive for almost three hours, crossing frontlines under gun fire to reach the facility. Once again, MSF calls on all warring parties to put stronger measures in place to ensure protection for civilians; to facilitate access to medical facilities for all the sick and wounded; to allow humanitarian and medical supplies into all areas; and to protect medical staff and health facilities.